Writing about my dad's hommus recipe the other day reminded me of another specialty dish of his. 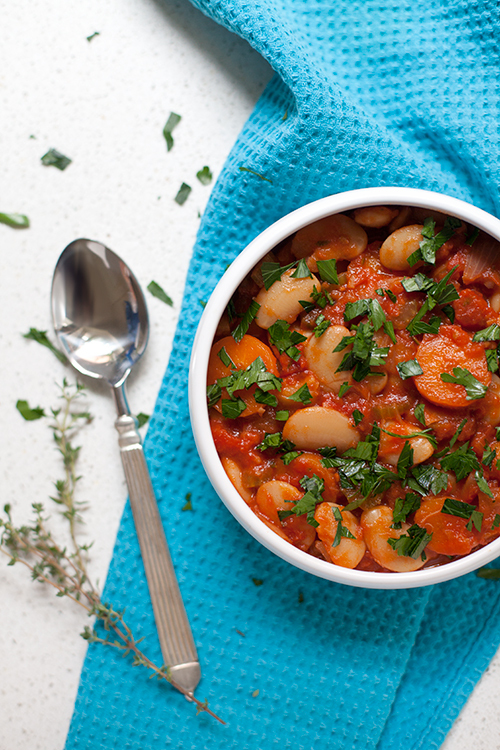 Beautiful, big white beans slowly baked in a tomato-based stew with carrots, onions, celery, bay leaves and thyme, served with scatterings of roughly chopped parsley. These flavours are about as Greek as they get and the aroma throughout the house when a combination like this is stewing in the oven just makes me want to lie down on the kitchen floor and levitate to Greece. See? I was levitating when I took this photo. Along with many other boat-loads of Greeks escaping the turmoil of Egypt in the mid-1950s, my dad Takis arrived in Australia with his new wife (my mum) Fifi in search for a better life. Settling in Melbourne, Takis worked hard from day one, covering the gamut of job opportunities on offer in the lucky country at the time, from insurance and sales to electronics and food manufacturing. But it was the food industry for which Takis would develop a passion, and the following three decades would provide him with the most satisfying years in food manufacturing, owning and running (to his childrens' delight!) his own ice cream factory. Takis had a great respect for his factory workers, as did they for him. Most of his staff were Greeks and Italians of the 1960's wave of immigration to Australia. He knew how hard it was for people to leave their homeland and their family and friends behind to find work and start their life over in a new country. Takis gave them an opportunity and they gave him their loyalty, many of them remaining dedicated workers at the factory for more than 30 years. It was this mutual respect that created such a strong relationship between employer and employee, along with a few perks like free tubs of ice cream to take home to their families, and free lunch every day at the factory for all the workers. You may remember me talking about my dad's obsession with food experimentation. This obsession goes way back to the mid-70s when he developed his first ice cream brand, Swan's Ice Cream, available in vanilla, chocolate and Neapolitan. Various flavours of gelato were also added to the product list, as well as many Italian dessert ice creams like Cassata and Tartufo to cater for the growing number of Italian restaurants popping up in Melbourne at the time. Takis had a purpose-built laboratory on the ground floor of the factory where he would spend days and nights developing flavours and recipes for his ice creams. I loved that room. All those colourful bottles and jars, tubes and packets, powders and creams – it was just like Willy Wonker's chocolate factory. There was also a large, fully equipped industrial open-plan kitchen/dining area for Takis to further his experimentation. It was the ultimate, stainless steel kitchen wonderland and was also utilised by two of the employees whose job it was to prepare the free daily lunch for everyone at the factory. Takis and the two Greek ladies, Voula and Katie, would spend a couple of hours each morning in the kitchen preparing large batches of food, usually consisting of a massive cauldron of soup, a huge tray of baked vegetables, another huge tray of some sort of pasta or rice-based dish, a gigantic bowl of Greek salad, and an enormous basket of fresh bread rolls. Over the school holidays I worked at the factory for some extra cash and I too would join the rest of the workers in the lunch room to enjoy the beautiful array of food and the good company of all the wonderful people that worked there. Unlike many stark and cold workplace lunchrooms, the whole kitchen was buzzing with conversation, clanging cutlery, laughter and movement, and the sweet aroma of what ever just came out of the oven or off the stove top. It was a time to relax and chat with workmates, enjoy a fresh, home-cooked meal, and recharge for the rest of the day's work. By far, my favourite lunchtime meal at the factory was the hearty Gigantes stew. I don't make Gigantes very often myself – it's another one of those dishes that I simply haven't been able to recreate the way my dad, Voula and Katie would to make it. I have my dad's recipe and I follow it to the letter, but you know, it's probably something as simple as using a different brand of olive oil that changes everything. This dish still tastes wonderful though. 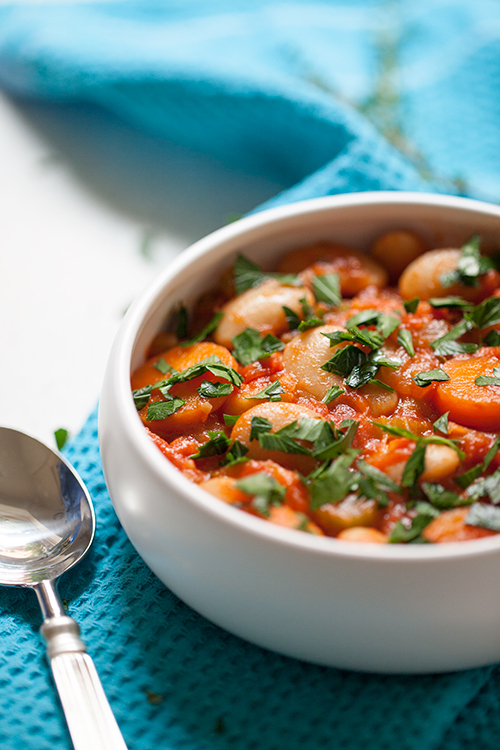 Gigantes is a heart-warming stew, perfect for the cooler nights approaching with the Autumnal season here in Australia. Even with the arrival of Spring on the other hemisphere this stew would still be welcome as the evening frosts settle in. 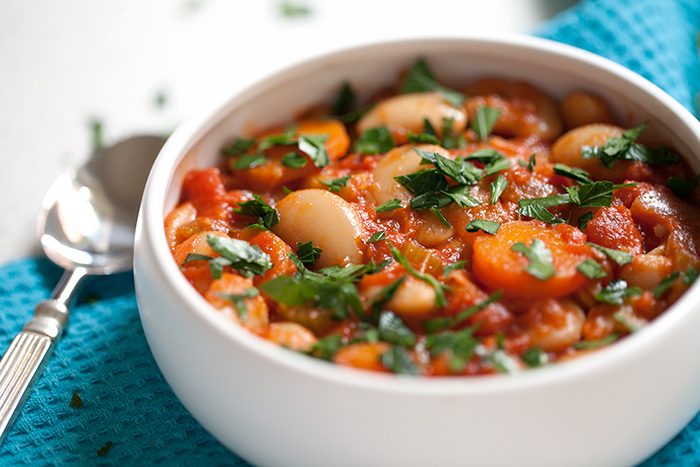 * Note: Traditionally, 'Gigantes' or 'Elephantes' beans are used to make this dish which, as the name suggests, are larger than Lima beans. These are grown in the northern regions of Greece and can be expensive and difficult to find here in Australia. 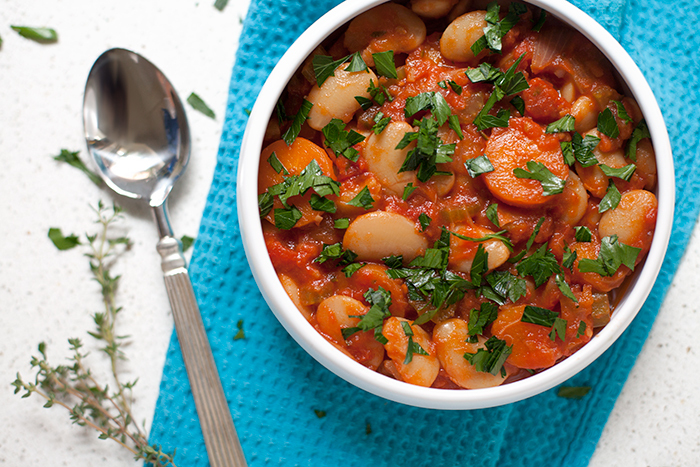 If you can't find Gigantes beans, Lima beans make a great substitute. After soaking the beans overnight, drain and rinse then transfer to a large pot with the halved onion and carrot. Fill the pot with water, bring to the boil and allow to simmer for one hour. 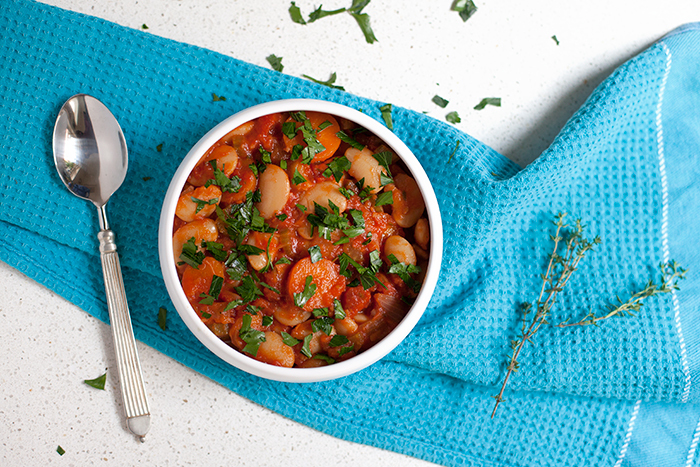 When beans are cooked, drain, discard onion and carrot and set aside. Meanwhile, in a large oven-proof casserole dish, fry the finely chopped onions and celery in olive oil until soft, around ten minutes. Add carrots to the onion and celery mixture and fry for another ten minutes, stirring occasionally. Add the cooked beans, vegetable stock, water, tomatoes, bay leaves and salt and pepper to taste, and bring to the boil. Transfer the casserole dish to a preheated oven at 150 degrees celsius and cook for one hour with the lid on. If your casserole dish doesn't have a lid, cover with foil. After one hour, remove dish from oven and give the stew a good stir, then place back in oven for another hour with the lid slightly askew (or the foil slightly loosened) to allow the steam to be released and the sauce to thicken. Keep checking the stew to make sure it doesn't dry out and add a little water if necessary. It's so good Deb, the beans absorb all the flavours so beautifully. It freezes really well too. what an amazing story! your father sounds like a truly wonderful father, businessman, and boss. to have lunch made for his entire staff everyday just shows how much he cared about those that were helping build and grow his business. my favorite restaurant has an entree that has a side of a gigantes bean salad. it is SO GOOD, and wherever dayv gets that meal, he lets me eat the salad. i love the bean's texture, it's so much different that any other bean. i am excited for this recipe because i've always wanted to try making a dish with these beans, but never knew where to begin. this looks perfect! Thanks Caitlin. My dad's pretty special. Oh yes, I love the gigantes bean salad too! But they never give you enough! The places I go to serve up maybe 6 or 7 beans on the edge of the plate. I know they're big beans, but I can eat more than 7 of them!!! My goodness. This look absolutely divine. Also, I love the story behind it, your father sounds like an amazing man. Thanks Kait! I can't wait to make your stuffed avocadoes. I'm going to do a Greek take on them and post about them here next week.. Thanks Laura! I do love getting carried away with the stories behind a dish, sometimes forgetting about the dish entirely! And thank you for reminding me to add a link to my dad's hummus recipe here on this post. Hope to see you here again soon! I loved the story behind the dish! How I wish I could work at your dad's ice cream factory!! Oh, yummy! That is such a scrumptiously healthy dish. I could eat that on a daily basis. Oh how can anyone not love lima beans! Oh the dill, I forgot the dill!! This sounds delicious, but I have to wonder...no garlic? I know! It seems somehow wrong not to put garlic in a Greek dish but my dad never uses garlic in his gigantes. I must try it with garlic next time I make it. Just wanted to say how much I love these gorgeous photos. What a treat. Have been enjoying a look around your recipes list - yum! Thank you Seana :) Actually, I just submitted a photo from this very post to a food photography competition! Reading your dad's story in the beautiful way you've written it brought a huge smile to my face. The abundant array of food, the whole company sharing a meal, chatting, laughing - I can picture it through the words you used. That must have been such an amazing experience with people from different cultures working together and creating friendships. I fully agree with you on never being able to recreate any of the dishes my mum's or grandma's recipes just the way they do. Even following their recipes to a T I don't think they'll ever turn out that way. That being said your dad's Gigantes sound so tasty I really want to give them a try. Maybe next time I'm at my parents's?! I am from Greece. Sorry, but none of your recipes are in any way authentic. Greek cooking (the traditional manner, like these beans) does not use stock or animal fat and I honestly think it's a crime to ruin beautiful natural ingredients with things like stock. It's called ´ladera´ in Greek to prepare food traditionally, means only cooked in oil. It was the food of the peasants, but now is our traditional cooking. Briam, giouvetsi, gemistes, all of that. Those foods were, by the way, always vegetarian. Meat was only added on special occasions or by rich people, cheese was optional. It was also great for the bread of yesterday, if you dip it in the oils and the sauces of the food, it tastes better than dry older bread. I was looking through your recipes, and I was going to copy a few down to use myself, until I read the vegetable stock. May I ask why you use that? Thanks so much for your comments and feedback. To leave a comment, please choose your profile account from the dropdown menu below. If you don't have a profile account, you can use the "Anonymous" option but please remember to sign your name at the end of your comment so I know who you are. Greek vegetarian food. Is it actually possible? Does such a phenomenon really exist in a cuisine that is mostly about meat? Well, the "mostly about meat" bit is mostly a misconception. The fact of the matter is that almost half of what you'll find in any Greek cook book or Greek restaurant menu is actually vegetarian. And anything that isn't vegetarian, can be made vegetarian. I'm Lisa, a vegetarian that loves Greek food and I know I'm not the only one out there. This is a place where you can discover the many facets of Greek vegetarian food. You'll find recipes, photos and all sorts of stories that I can't wait to share with you. Are you up for the challenge to help a wonderful cause striving to end factory farming? Click on the MFW logo to find out more. © 2013 Lisa Stanton. Powered by Blogger.